Meredith Hall’s moving but unsentimental memoir begins in 1965, when she becomes pregnant at sixteen. Shunned by her insular New Hampshire community, she is then kicked out of the house by her mother. Her father and stepmother reluctantly take her in, hiding her before they finally banish her altogether. After giving her baby up for adoption, Hall wanders recklessly through the Middle East, where she survives by selling her possessions and finally her blood. She returns to New England and stitches together a life that encircles her silenced and invisible grief. When he is twenty-one, her lost son finds her. Hall learns that he grew up in gritty poverty with an abusive father in her own father’s hometown. Their reunion is tender, turbulent, and ultimately redemptive. Hall’s parents never ask for her forgiveness, yet as they age, she offers them her love. What sets Without a Map apart is the way in which loss and betrayal evolve into compassion, and compassion into wisdom. “Fans of Jeannette Walls’ The Glass Castle should take note of Meredith Hall’s memoir, heartbreaking and ultimately heartwarming despite its unsentimental prose. As a naïve 16-year-old who finds herself pregnant and kicked out of her home, Hall is then forced to give up her child for adoption. Years later, after a tumultuous life, her first son tracks her down. A moving exploration of love, loss and forgiveness. "In 1965, Meredith Hall was just another young girl who got pregnant at 16. Think you know the whole story? Guess again, because Hall colors outside the lines with this memoir, full of unexpected twists and turns...Hall eloquently tells the story of her rebirth... Achingly sad, this is a stunning exploration of the mystery of 'love and all its failings...and its final redemptions.' A haunting meditation on love, loss and family." 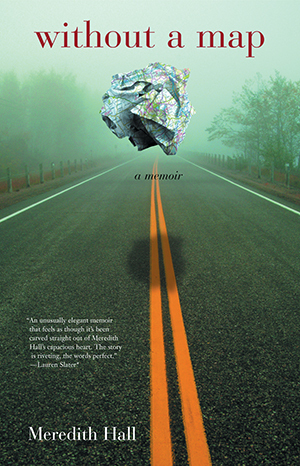 "Hall emerges as a brave writer of tumultuous beauty."